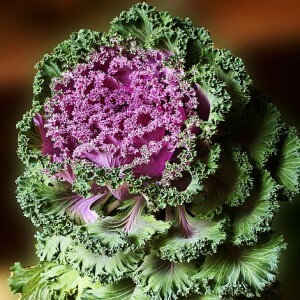 Brassica oleracea is the biannual plant of the family of Cruciferae, blossoming in the first year of crops and keeping the decorative properties since August to hard frosts. On the second year of life fruits – quite large seeds keeping viability within 3-5 years are formed. The homeland of Cabbage decorative is the Atlantic coast of Western Europe, however now, thanks to the unpretentiousness, the plant successfully grows and in regions of a temperate climate of Europe, Africa and Asia. The next ancestor is the Cabbage of fodder sheet forms therefore it is often difficult to distinguish these plants. The stalk of Cabbage decorative is truncated, forming the socket of leaves. Thus leaves can be continuous, round, slightly wavy, curly, lirovidno-plumose, redkonadrezanny, with different degree of a gofrirovannost. At the stalk basis they settle down on scapes, and in the top part – sedentary, extended. Ornamental cabbage. Ornamental cabbage cultivation.